Perched on one of the highest elevations on Waters Edge (high and dry), and situated among gorgeous live oaks providing privacy. This 6 bedroom (2 master suites) and 4 bath home has an open floor plan with 2 sitting areas, a game room, and private pool. The top level includes; a master bedroom, great room with gas fireplace, wet bar, kitchen, covered porch, and spacious decks. Mid Level: 2nd master bedrooms, 3 guest bedrooms that share a full bath, laundry, and a large sitting area with deck access to the hot tub. Ground Level: One bedroom, full bath, game room with pool table, and slider to private outdoor pool (12x28). Just steps away from the Atlantic Ocean and Ocean Sands 9 acre lake. Perfect for fishing, kayaking, feeding the turtles, or jogging the 1 mile loop. 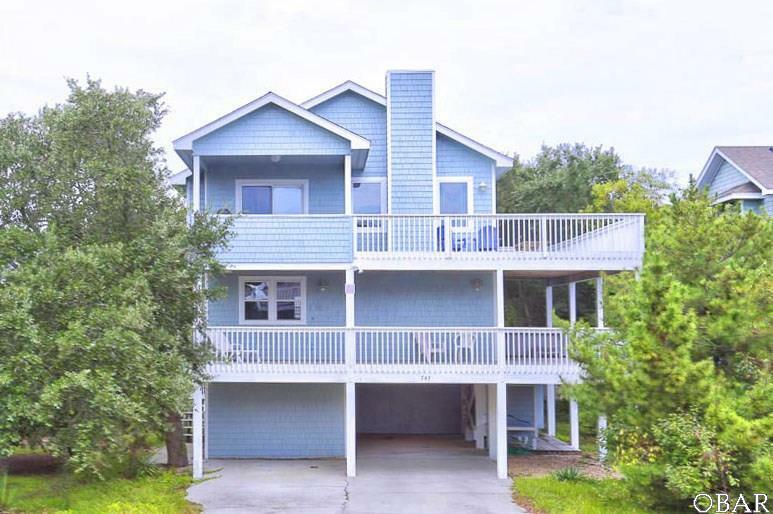 Central location close to shopping, dining, and Currituck Club Golf Course.